UPDATED: The cards have been updated here to include related concepts! 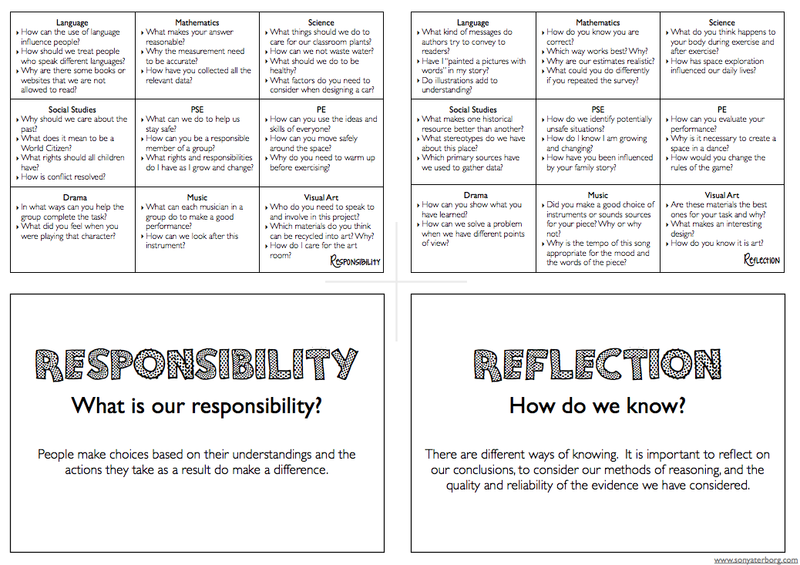 Last year, I wrote a post about Questioning Conceptually. The basic premise of this post was a look at how teachers and students could use the PYP concepts to deepen their inquiries through the generation of a wider range of questions. The post goes on to help narrow the focus of the inquiry into an area of interest that one is really passionate about, that you care about, and that is worthwhile spending time on. I followed this up with another post about the same topic: More Conceptual Questions. Both of these posts make reference to a set of Concept-Question Cards. 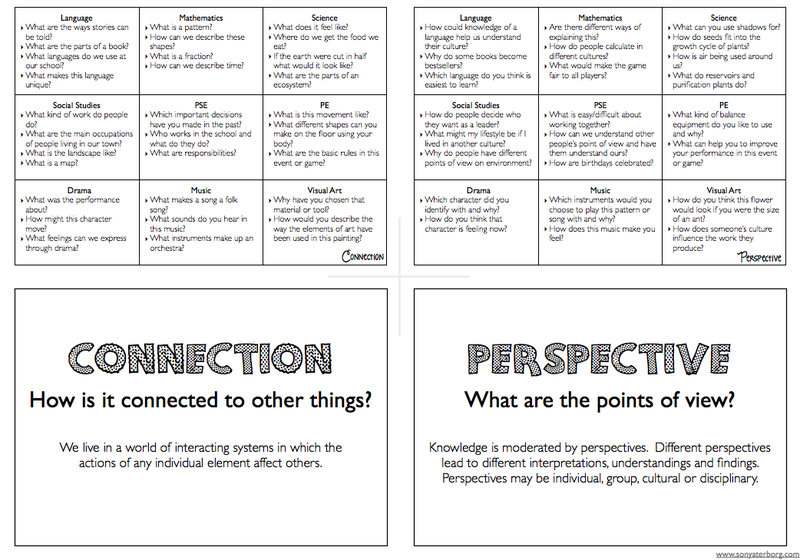 These cards have one side with a PYP concept, guiding question, and explanation and another side with sample questions from different subject areas. I have had sets of these cards in my ‘toolbox’ for some time now. They are great. To download a PDF set of cards, click here. Awesome! Love it when that happens! Good luck with the Genius Hour/Passion Projects. Thank you for these. I was making some up myself a few weeks ago and was going to ask you for yours. You must have read my mind. 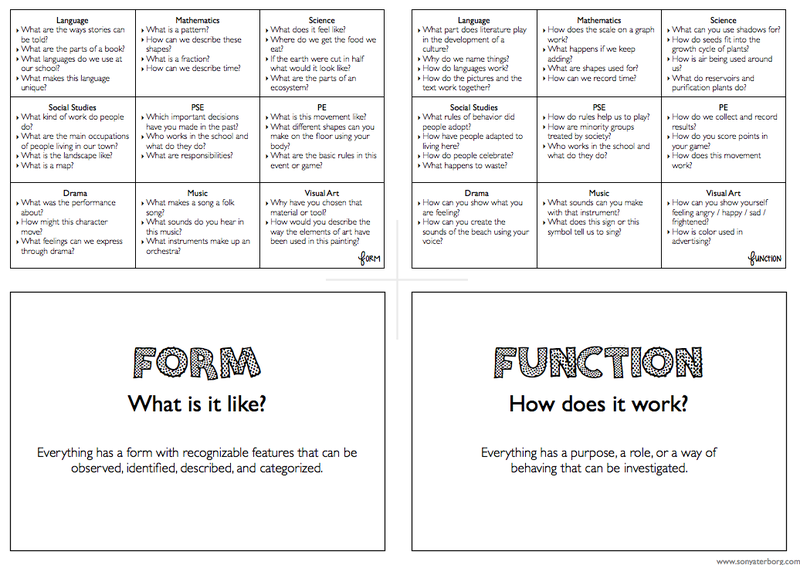 I took all of our teacher questions from each of our six unit planners, plus the questions from the PE, Mandarin, Maths and Music unit planners and slotted them into the concept cards. It was interesting to see where most questions fell (or didn’t). Science was definitely lacking across the concepts. Music was surprisingly balanced. I don’t know if the questions need to be balanced across all the concepts – but it is something to think about. I am breaking out in a cold sweat and too scared to even check as we have just had a bunch of parents make up a whole lot of sets of cards for us. I am praying you are wrong (which I know you are probably more than likely not). What is likely is that I lost my train of thought half way through as I did Form first and then copied the format and deleted the content. Except it sounds like I didn’t delete the content. OK….let me check….Dang! You are so right. Thank you so much for spotting it! I will change it as soon as I get to work and then re-upload. Thanks for letting me know! Oh priceless – your verbal cold sweat cracked me up! Thanks for checking and reposting! Sonya, these are great! I was wondering if you have re-uploaded the cards to fix the form/connection questions? Bula! Sonya from Hanoi. I have just used your concept card questions with my fifth grade class this morning for our response to reading task (teaching others to swim and love swimming), and after recess doing a formative on theoretical probability. It has enabled my students to think deeper about the kinds of questions they ask. Interesting enough I had a girls and boys group. The girls answered both questions the boys wrote for them, to which the girls replied were easy questions. The second question the girls asked (What was their motivation to teach others how to swim?) was definitely conceptually-based and the boys just could not come to an agreement of what the answer should be. Great! tool for my fifth graders as we begin to reflect on how essential questions are created to help us think critically – a stepping stone to Exhibition preparation. 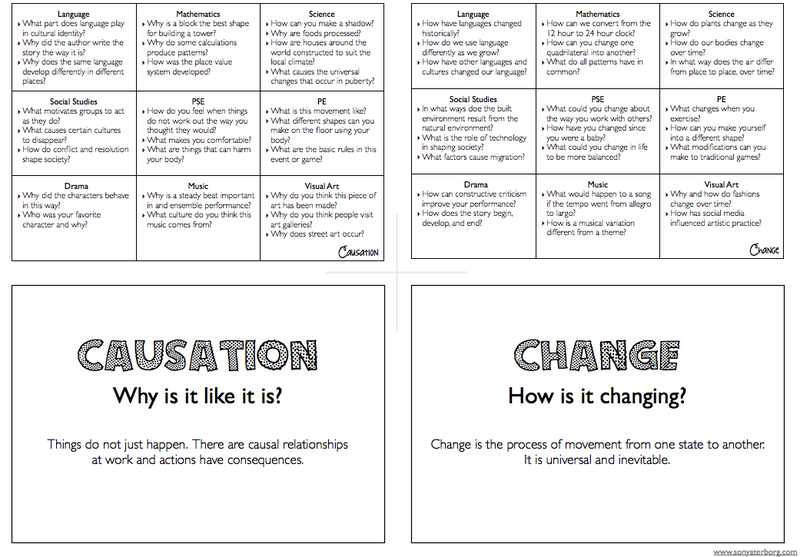 Amazing thought of creating concept cards which is a great resource for questioning your students. Thank you so much Sonya! I have used this with my students and with teachers at my school to help generate questions. I also recently shared them at a workshop and gave credit to you! Thanks so much! 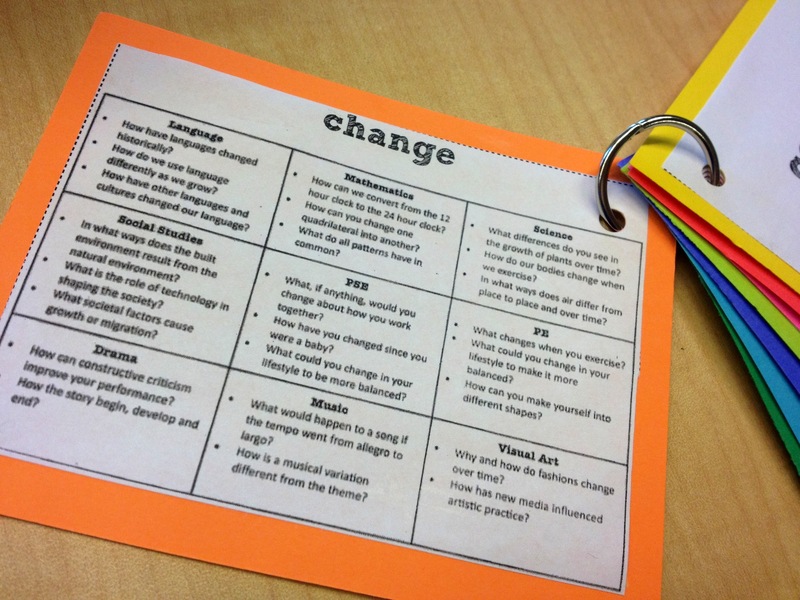 I love how your cards cover questions across all areas of the curriculum. Quite often when we look at forming questions, we focus on our Units of Study instead of looking across the curriculum. My team talks a lot about intentionality and making sure we plan for teaching the students how to ask good questions and this resource is golden for that. Although we are no longer a PYP school, we do focus on concept based learning. This is definitely something I’m going to share with my team to figure out how we can teach our students how to generate a wider range of questions.